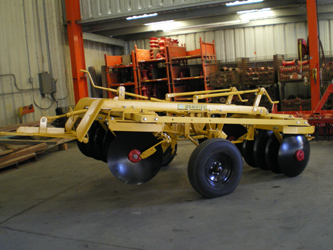 Specifications: blades 24" notched or solid on 9" spacing, 1 1/8 inch square gang rods, double wheel seals on Timken bearings with wear guards, center ripper shank, 7.50 x 15-6 ply tires. Sizes: 6'6" to 9'6 inch. Weights: 2760 to 3241 pounds. Options: blade cleaners, toolbar mounting brackets, front and rear fenders, wheel hub dust protectors, dirt deflectors and hydraulic hoses.